I got invited to give a talk at Gyldendal as part of a book launch event for the book “Det man måler er man selv” about the self-tracking phenomenon. The author is Anders Høeg Nissen. 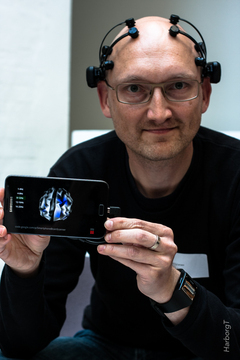 In my talk I discussed some of the perspectives on self-tracking and quantified self and used our smartphone brain scanner as an example of how we can measure our brains. The picture is courtesy of Thomas Harborg.